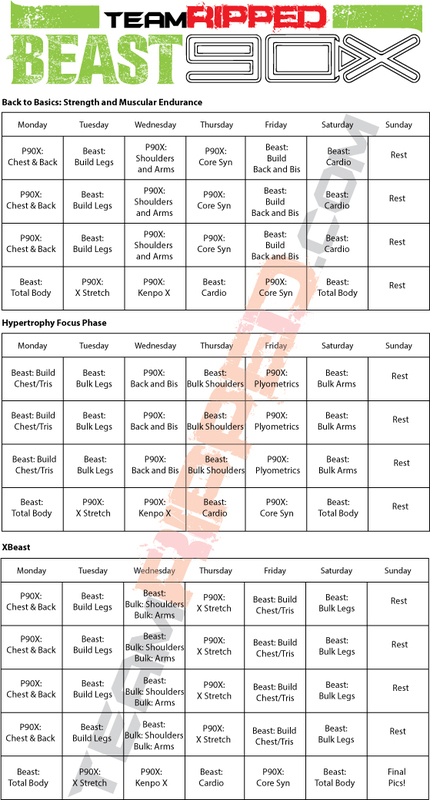 Coach Wayne’s P90X and Body Beast Hybrid is here! It’s been requested and now it’s time. The CLASSIC, all-around fitness maker P90X and the muscle mass packing Body Beast. Together as one! Why combine P90X and Body Beast? Outside of you asking for it, they are two of the BEST programs that Beachbody has to offer. They also offer a great synergy in muscle and strength building. While P90X has mostly body weight work for your large muscle groups (Chest/Back/Legs), Body Beast punishes those muscle groups with heavy weight dumbbell work. It’s a great combo! You get tested on strength and endurance and still get tons of hypertrophy work to build great muscle. Let’s face it, it’s hard to get enough weight in your bag pack for hypertrophy push ups when you have been built strength through P90X. So we take the best of both and get an awesome P90X and Body Beast Hybrid! Let me start out by saying this is a TOUGH Hybrid! By Phase 3: XBeast, you will be earning each workout with a lot of grit and sweat! You will work up to that point but in phase 3 I really increased the volume and you will hit chest and legs each twice a week. You have an X Stretch back midweek, so take it! Really use those X Stretch days for recovery and don’t skip them! You should be going hard enough that you can’t add more to this P90X / Body Beast Hybrid. Right click to save image or click to open. Let’s go through the phases before you jump in. This will help you shape your focus. Back to Basic: More P90X in this first phase. This will help you build a base of fitness and muscular endurance. You get to hit back twice a week as so many people need pull up work. Nothing builds a strong, big back like pull ups. Focus on QUALITY reps. Full extension and chin over the bar. No kipping! If you need the pull-up assist, get one! They are a great tool. If you’re already a pull up machine and can knock out 15 a set no problem, get a backpack and do weighted sets of 8-10 to build more strength and muscle. Hypertrophy Focus: More BEAST this phase focusing on hypertrophy. You don’t get a midweek recovery workout this phase. So do your workouts and recover the rest of the day. Don’t be a hero and add more HIIT or this or that. Really give your all to these workouts! Plyo after a Tuesday Bulk Legs will get you used to a little more volume on legs without adding a second leg day of lifting. That’s coming though… Next up XBEAST! XBeast: This is where the boys will be separated from the men, and the girls from the women! LOTS more volume and hitting muscle groups twice a week. You should be ready at this point but always listen to your body. Feel free to add a weighted backpack to Chest and Back to amp it up and get you reps down, but focus on getting your work done, eating to your plan, and recovering for the next workout. Leg day twice a week will definitely put some meat on your bones! In the link below you will find workouts to track your Beast90X hybrid. Not all workouts have worksheets, so I included what I had. For example, no worksheet for X Stretch. But check them out! So who’s going to take this on? Need Body Beast? Get it HERE for $40!